Octopus in Greek Htapodi (χταπόδι), pronounced Hta-POH-dhi, is a Greek word. “Okto” meaning eight and “pous” is the ancient word for foot. Having eight feet (tentacles). If you want to clean and then cook an octopus dish but you don’t know how to do it, I hope that my post and video will help you prepare and enjoy this seafood delicacy. Cleaning an octopus may be intimidating and a challenge for people who try this for the first time. However, this seafood delicacy is easy to clean and if cooked properly you will have the most delicious and tender seafood, which can be cooked in many ways. It can be stewed, boiled, grilled, fried, baked or used in a salad with potatoes, served as a main dish or an appetizer etc. Octopuses have no bones but a lot of hard muscles which have to be tenderized. 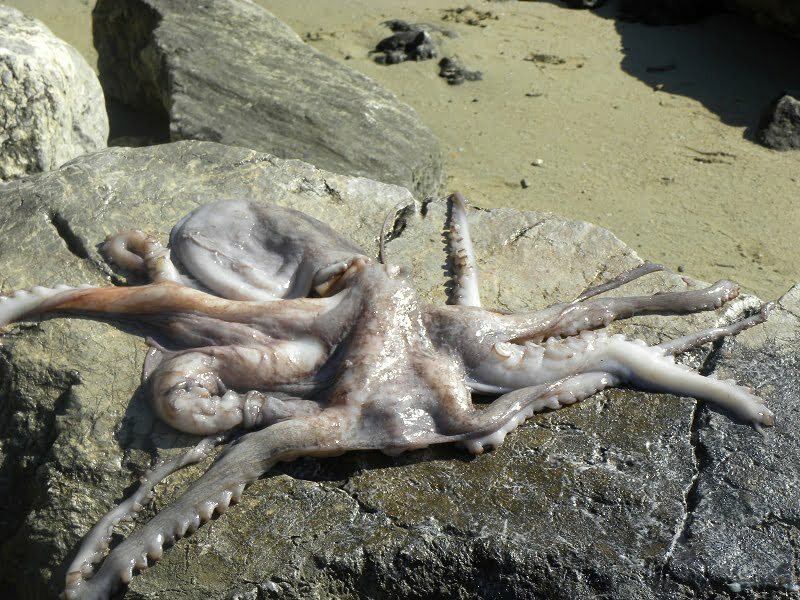 The first thing fishermen do in Greece when they catch an octopus is to keep beating it on rocks or if there are no rocks, on the shore for about 40 – 50 times. All the fibres break apart and the octopus is tender and succulent. In Greek seashore restaurants, you will see octopuses hanging from a clothesline because it also helps if it is dried in the sun for 2 – 3 hours. My late brother-in-law used to go fishing and catch octopuses. So does my nephew, who owns three restaurants in Cyprus, two of them on the shore of Ladies’ Mile and one in the old city of Limassol, loves fishing and I’ve seen him catching octopuses many times. He knows all the tricks about octopus. He usually finds them near rocks but if there aren’t any rocks he knows other tricks to catch them as well. One day when we went to the beach, in Karlovassi, Samos, where we lived at the time, he said I’ll be back in ten minutes with some octopus. He did not have any special equipment but he soon came back with an octopus. We were all speachless! As he told us later on, he had previously found some soda cans, he opened the top and left them on the sea bed. Octopus like to hide so he knew that if there were any octopuses in the sea, he would probably find one in one of the tins. In the middle of the tentacles there is a beak (mouth) and above the tentacles is a sac which includes the ink sac, stomach entrails and the remaining organs. Cut the head off, above the eyes and the tentacles below the eyes. Discard the part under the sac and above the tentacles. After cutting the head, empty the sac. This is where all the organs are. Then turn it inside out and pull away anything that is inside, trying not to break the ink sac. Wash inside well, then turn it over again. If the octopus is big, you can also remove the skin from the head, by just pulling it. Remove the beak by cutting it round the tentacles. Discard the beak. Rinse the octopus and let it drain. Note: Frozen octopuses are cleaned from the entrails, so the only thing you need to do do is remove the beak and the lower part of the sac. Heat a pot or a sautéing pan with nothing inside. When the pot is hot enough, put the tentacles and sac in the pot. The octopus will soon start sweating out a pink liquid. If the octopus does not excrete any liquid after the first few minutes, add half a cup of water so that it helps it get started. Turn it often so that it will not stick to the pot. Repeat this until all the pink liquid is extracted. Cover the pot, lower the heat but keep checking to see if there still is some liquid inside. When there is no more liquid left, it means that the octopus is ready. At this stage you can eat it as it is or cook it further. The best way of eating an octopus is grilling and serving it with an olive oil and oregano dressing. It is considered as one of the best mezedes to accompany a glass of ouzo or wine. Clean, wash and cook the octopus as above. Remove to a platter to cool and when it can be handled cut it into small pieces. Place the vinaigrette ingredients in a shaker and mix well. Pour on top of the octopus and serve. Add salt and adjust, pepper, oregano and vinegar to suit your taste. If you wish to grill your octopus, just follow the same cooking method and before cutting the octopus, marinate it in olive oil, wine vinegar (or lemon juice), a bay leaf and oregano for at least half an hour. Preheat the grill or charcoal and quickly grill the octopus on both sides. Cut it into smaller pieces and serve with extra olive oil, salt, freshly ground black pepper, dried oregano, lemon juice or vinegar. Although risotto is an Italian traditional dish, I have made this recipe “nistisimo” i.e. Lenten, in order to have a variety of dishes during Lent. During non fasting periods, instead of using vegetable stock or vegetable bouillon and water, chicken or fish stock may be added and some grated cheese mixed in the end. Cut the octopus into 1 inch (2 ½ cm) pieces and drain. Add the tomato and tomato paste, half cup water, as well as salt and pepper and bay leaves and bring to a boil. Reduce heat, to low, cover and simmer until the sauce is reduced, about 15 – 20 minutes, mixing every now and then. In a separate sautéing pan or non-stick frying pan with a lid, heat 1 tbsp olive oil and sauté the mushrooms. Remove to a platter and set aside. Meantime, heat the water and dissolve the vegetable bouillon or use stock. Add the remaining olive oil and sauté the onions until translucent. Add the garlic and saute it for a few seconds until fragrant. Add the rice, mix to coat well with the oil and then add the wine and mix until the alcohol evaporates. Add the octopus with its sauce and mix. Gradually add a ladle of broth each time, stirring until it is absorbed and continue until rice is cooked al dente, about 15 minutes. Five minutes before it is ready mix in the mushrooms and the parsley. Both recipes are included in my cookbook Mint, Cinnamon & Blossom Water, Flavours of Cyprus, Kopiaste! Thanks for your post with so many great and very very effective tips.